Since its introduction in 1984, the Roland GR-700 ($1,995.00) has been the most widely used guitar synthesizer. In fact, today Roland makes the only integrated controller/synthesizers for guitarists. It has a fat analog sound (it's actually a hybrid of digital and analog), and it's a very easy system to learn. In 1985, the GR-700 was joined by the GR-77B Bass synthesizer ($2,149.00). Styled like the GR-700, it contains more sophisticated circuitry than its guitar counterpart, simply because it is much more difficult to perform pitch-to-voltage conversion on bass than on guitar. Both are available with matching instrument controllers; the guitar is the G-707, and the bass is the G-77. Aside from the striking body shape, each has a "stabilizer," an extension that connects the body to the headstock and is intended to minimize resonances that may adversely affect the pitch-to-voltage process. The GR-700 module can also be controlled by Roland's G-303, G-808 and G-505 guitars, as well as by instruments by other manufacturers. 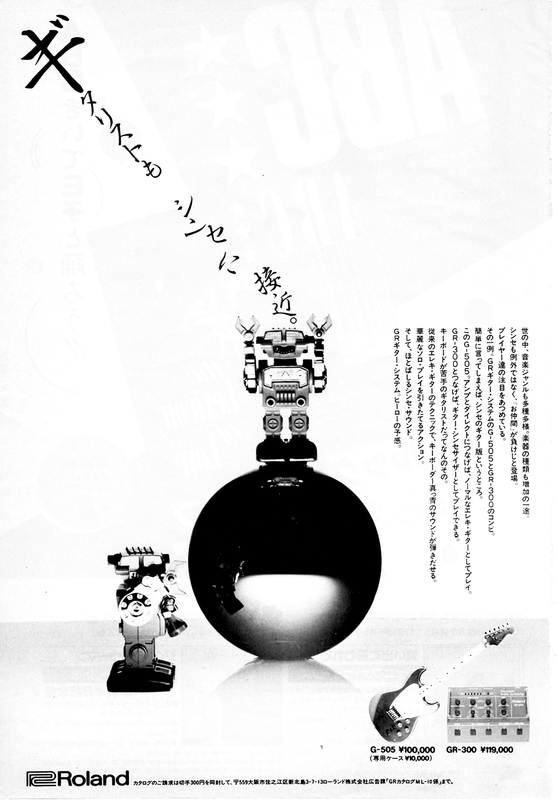 The bass synth can be controlled by Roland G-33 and G-88, and other basses are expected to be available soon. Both units have MIDI outputs, but no MIDI input. Therefore, connecting either unit to a sequencer is sort of a one-way proposition; to play sequences back, it's necessary to have a second MIDI synthesizer that accepts MIDI inputs. (An aftermarket modification is available to give the GR-700 MIDI-in capability.) Also, neither the GR-700 nor the GR-77B transmits pitch-bend information to other equipment via MIDI instead, they transmit chromatic changes (half-steps), This isn't too much of a liability for bassists, but for guitarists who are used to the expressiveness of bending, this can be a bit limiting. Note, however, that both the GR-700 and the GR-77B do produce pitch bends internally; in fact, their on-board synthesizers are extremely versatile, and their pitch bends are very smooth. It should also be noted that besides sending Note On and Note Off data, MIDI is useful for other functions such as transmitting Program Change information (which is becoming more and more useful as manufacturers of effects and amps are starting to have MIDI-controlled parameters on their units). The GR-700 is housed in a sleek, silver-colored heavy-duty plastic-and-metal case with two rows of footswitches and a group of soft-touch membrane switches for various mode selection (more on these later). The red LED indicators are 1" high and very visible from several feet away. The GR-700 stores 64 programs internally, and using an M-16C cartridge, it is possible to store 64 more. Presets are arranged in eight banks of eight programs each. They are recalled by stepping on the Bank switch and then any of the footswitches numbered 1 through 8 (when going from one preset to another in the currently selected bank, it isn't necessary to step on Bank again). On the back are a memory cartridge port, the multi-pin port for connecting the guitar, a small pot for tuning the synthesizer, an input for the optional PG-200 programmer ($295.00), a MIDI output, a memory protect switch, two inputs for voltage pedals (Pitch Bend and VCF), a guitar-only output, two guitar/synth mix outputs for stereo or mono operation, a 3-way output level selector, and two XLR output jacks. When you set up the synthesizer, make sure the ends of the multi-pin connector are plugged into the guitar and module correctly. Locking mechanisms make it impossible to accidentally unplug. Tuning is easy, and there are two approaches. First, you can tune your guitar to an electronic tuner and then adjust the master tuning knob on the back of the synth module to match pitches. The second approach is also simple. Step on Edit, followed by 48. Each time you play an open string, the synth plays the appropriate pitch of that string, and you can simply tune each string accordingly. It you're using an electronic tuner, or if you want to adjust the GR-700's reference pitch to another instrument, turn the Edit knob on the guitar to zero-in the tuning. The membrane switches let you do a variety of things. 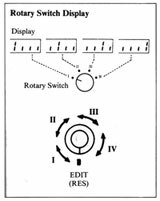 First it is possible to play sounds that come from parameters stored in a cartridge by plugging the cartridge into the port and selecting the Cartridge button. The Write button is for storing program data on a cartridge. To store an edited program in internal memory, turn off the Write Protect switch on the back of the unit, step on the Edit footswitch, select a two-digit bank/patch number, and then go back to Play mode. The patch is now programmed into memory. 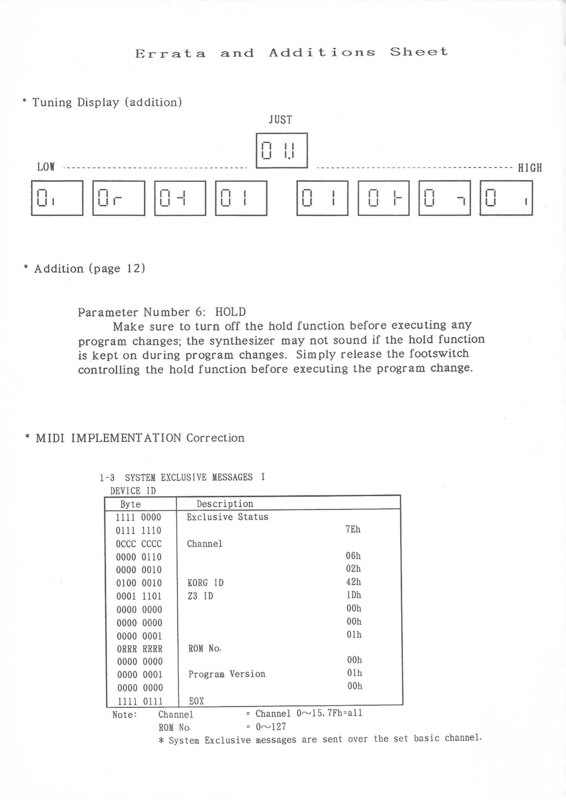 To save a program in the cartridge, follow the same procedure, but make sure the Cartridge switch has been activated. The next two buttons are used fairly often: Chorus and Chromatic. Chorus turns on an internal chorus device, which fattens up the sound of the GR-700. Chromatic lets you select either continuous pitch-bending or chromatic modes (during string-bends in chromatic mode, the pitch of the synthesizer only changes once you've raised the pitch by a semitone; each semitone translates into another increment). Chromatic is very useful for imitating piano or organ, where pitch-bending doesn't occur. 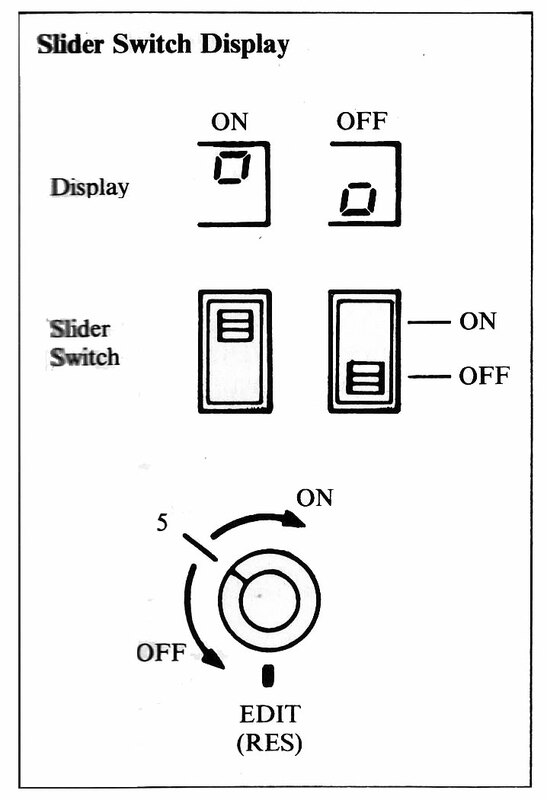 In the String Select section, there are four switches. These let you preset and access various functions. The Up/Down switch tells the synth to bend up or down when an external pedal is plugged into the Pitch Bend input jack. This switch works in conjunction with the Pitch Bend switch; you can choose any string or strings to be affected by depressing any of the small switches labeled 1 through 6. The small Hold switch lets you select which strings are affected whenever the Hold footswitch is depressed (this function allows you to sustain chords or notes while you solo over them). Likewise, the Voice switch lets you choose which strings create a synthesized sound when they're struck. This is useful for setting the synth to follow, say, your lowest two strings while you play stright guitar chords or leads on the upper four. 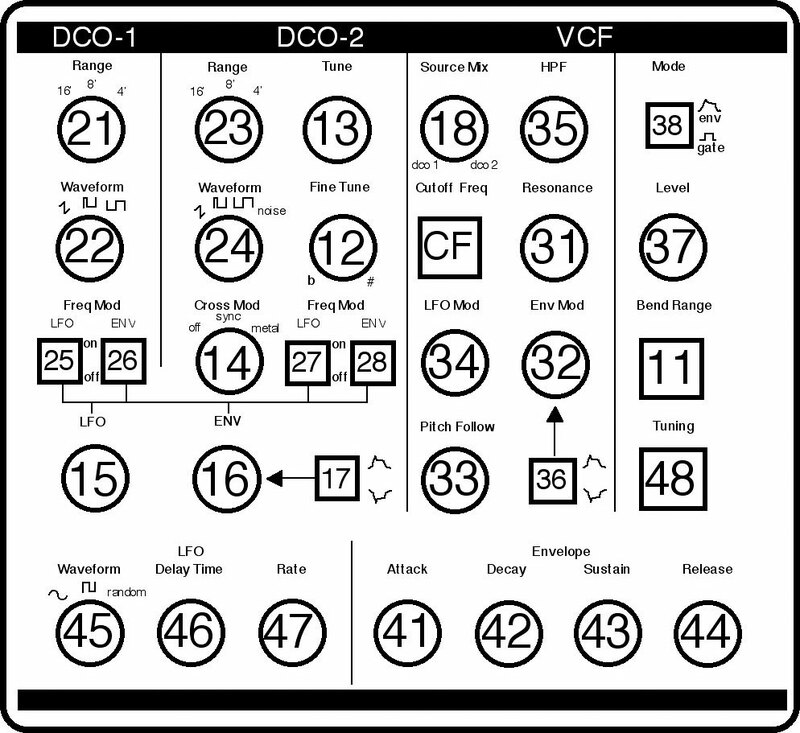 The dynamics section has three switches labeled DCO, VCF, and VCA (digitally controlled oscillator, voltage-controlled filter, and voltage-controlled amplifier, respectively). Setting the modulation depth of the DCO and VCF and the level of the VCA, plus selecting any of these switches, makes each of the corresponding functions follow the intensity of picked notes. There are two ways to edit patches on the GR-700. The first involves using the guitar and synth module alone; the second uses the PG-200 programmer. If you like to experiment with sounds, the programmer is the way to go. Such parameters as the tuning and frequency ranges of the two DCOs for each voice, the settings of the VCF and VCA, as well as envelope parameters (attack, decay, sustain, release), are each given a two-digit number. An Edit Map showing all the parameters and their numbers is included with the synth. To edit without the PG-200, simply step on the Edit footswitch and select a two-digit number. For example, to change the octave range of DCO 1, step on 21. In the left LED display on the module, the selected number appears. In the right LED window, three short vertical bars appear with a bar extending on of them (in some parameters, four bars appear). These indicate the three octave ranges. Turning the Edit knob changes the visual display and the octave range. When editing on/off functions (such as modulation), the LED window on the right displays a half-height "o" appears in either the upper half (for "on") or the lower half (for "off"). The third type of indication in the right LED display is a set of number - 00 through 99. These appear during changes of parameters such as levels, rates, and envelope times. Turning the Cutoff knob on the guitar whenever the Edit mode is selected changes the filer's cutoff frequency. The advantage to using the programmer is its overall ease: What you see on the front panel is what you get. You don't have to be in Edit mode to change any of the 33 parameters it controls. A cable with 6-pin connectors hooks it up to the back of the GR-700. Many of the GR-77B's functions are the same as the GR-700's. To edit a sound, you must depress a membrane switch instead of a footswitch, and tuning is easier (depress Tune, and tune any open string until there are no beats; the LED display shows A-440, but by turning the Edit knob, you can change it to any setting from 438 Hz to 445 Hz). Hold and Voice work the same way, except there are only four strings; Pitch Bend has Down and Up switches. 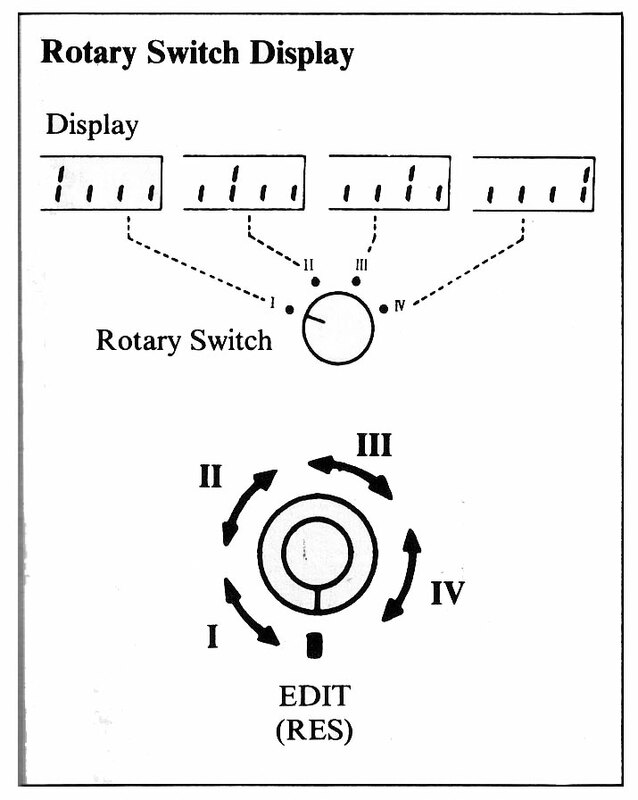 The cartridge is controlled by two Copy switches (for loading to and from the cartridge). The Hold pedal can be in either latched (on until you step on the switch again) or unlatched (only on when your foot is on the switch) modes. The oscillators have a four-octave range, and the edit numbers are different than the GR-700's; a complete edit map is included with the unit. Also, there are two envelope generators. An optional programmer, the PG-800, is available for simplified editing. The biggest differences between the guitar and bass unit are the Edit switches; in particular, the one labeled MIDI. By depressing the MIDI switch, you can then choose a number between 1 and 7 for the following MIDI functions: Channel, Program Change, Pitch Bend, Hold, Modulation, Volume, and Mode (Omni On or Omni Off). An eight position is Transpose (up an octave or at normal pitch). 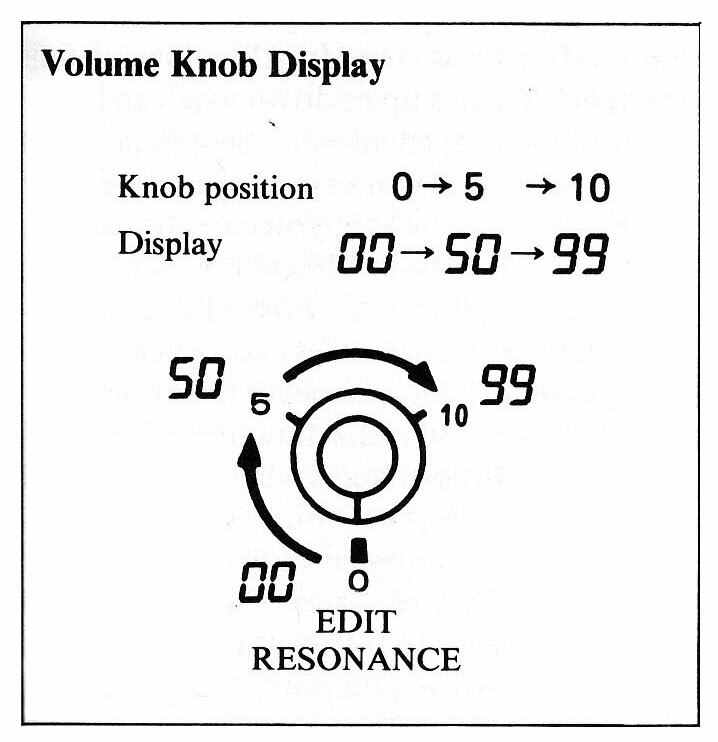 Once one of these eight functions is selected, the Edit knob on the bass adjusts the settings. To exit this editing function, depress MIDI again. Another important Edit switch is labeled Trig Level. 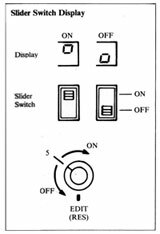 Depress this switch, and use the Edit knob on the bass to set the overall sensitivity of the synthesizer to your playing style. 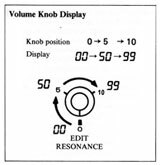 Turning the Edit knob selects a setting between 00 and 99 (00 is the least sensitive). How well do the Roland guitar and bass synthesizer work? Very well, depending on your playing style, of course. As Mark Altekruse says on page 38, it's a matter of playing cleanly and correctly. The range of sounds available with both of these synths is very good, and because there are so many editable parameters, you should be able to find a broad range of appealing sounds (many of the factory presets are also very good). Any of the Roland or Roland-compatible guitars works well; here it's a matter of playing comfort. The bass synth should appeal to bassists who feel that they've been edged out by keyboardists. Roland still makes the GR-300 and GR-33B guitar and bass synthesizers, respectively. Although they don't have the programming flexibility of the GR-700 and GR-77B, they are still good basic synths.